Our project has submitted written evidence to the UN Special Rapporteur on on extreme poverty and human rights, Professor Philip Alston. Professor Alston will undertake an official visit to the UK from 6 to 16 November 2018 at the invitation of the government. His visit will focus, in accordance with his mandate, on the interlinkages between poverty and the realisation of human rights in the United Kingdom. In our evidence, Project Director Professor Peter Dwyer, University of York; Dr Lisa Scullion, University of Salford, and Dr Sharon Wright, University of Glasgow, write on behalf of our project on the erosion of economic and social rights as a core component of national citizenship status and justifications for such rights on the basis of universal human needs. 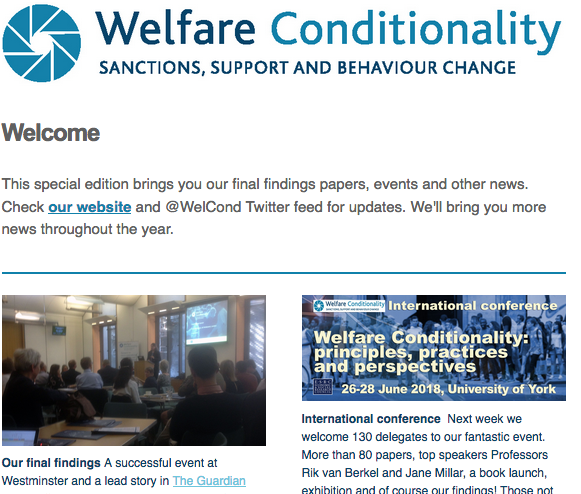 Based on our final findings, the researchers’ evidence details how benefit sanctions leave many unable to meet their basic needs, with those sanctioned increasingly reliant on charitable and (where available) familial provision for support. Read our evidence in full.